Good To Begin Well, Better To End Well: Misc. Update. here and square really don't rhyme properly, do they? Also: What the heck, Texas? You're really going after Thomas Jefferson?! 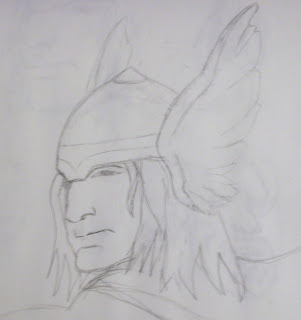 And a very poorly scanned Thor, take two. I'm proud of the feathers. Pose stolen unashamedly from Olivier Coipel. Sorry it's so blurry. Oh brother. Jefferson? Come on... I mean, I know I said I wasn't very interested in American history, but I do know Jefferson. You can't drop him for Calvin. That's just silly. Jefferson was an amazing person! It will be interesting (and probably a little sad) to see what is in the actual books. Yeah. It blows my mind. Jefferson was essential to the early US. And thanks! Come on, Texas, you're better than that! Another nice sketch. I'm not going to comment on Texas because my mother always told me If I can't be nice, I should keep my mouth shut, and this makes me very, very angry. Impressive picture! You're right to be proud of the feathers. I'm envious of your sketching skills. Also, I tried debating education policy with a friend of a friend. I decided it was futile when he came out as a fan of this Texas-sized foolishness. Shannon, Sarah, VR, and Yuri: I wouldn't be so affronted if they weren't poised to impose it on 80% of the rest of the country. Maybe other states will shop for textbooks elsewhere? Or at least provide supplementary readings! Does anyone else feel like George Orwell's 1984 is starting to come true a bit later than anticipated?